Creating charts is one challenge; organizing them is another one. Especially if you work as part of a team or create multiple charts per week, you need a good overview of your ever-extending chart portfolio. You can find this overview when you click the button “Team Charts”/ “My Charts” in the upper-right (which button you can see depends on if you’re part of a team). If you’re already logged in, here’s a direct link. In the following article, we'll go through the different options you have on this site. How can I delete or duplicate charts? How can I create, delete or rename folders? When you're in a chart folder, you'll see an "Add subfolder" at the top of the folder content. But you can also click on the triangle that stands next to the name of your folders at the top of the page. A little menu pops open. Here you can add a subfolder, rename this very folder or remove it. You can add as many hierarchy levels as you want. But you can only remove folders that don't have any subfolders; otherwise, you are asked to delete the subfolders first. 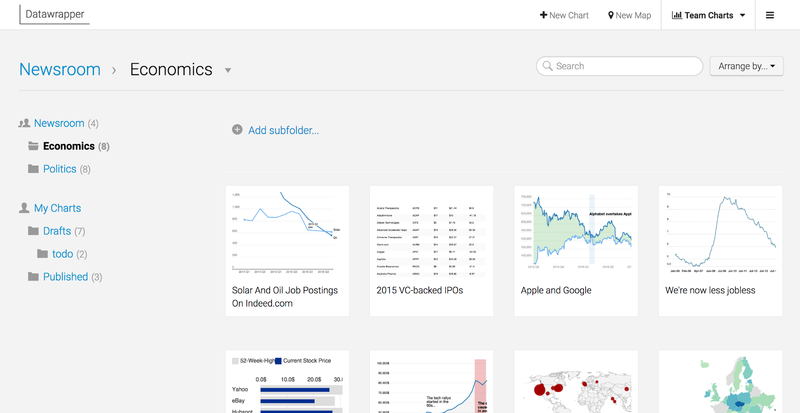 If you delete a folder that contains charts, these charts will not be deleted. They will move to the next-higher folder. How can I organize my charts? By language: Maybe you're a bilingual newspaper and want to sort your charts in “French Charts” and “English Charts”. By department: Economics, Politics, etc. By newspaper, if you’re part of a big newsgroup that owns several ones. According to your processes: “In Review”, “Social Media worthy” etc. I'm part of a team. How can I make my charts private? You'll see the name of your team and the charts you all created at the top of the left sidebar. If you create a new chart, it will still appear in the team folder by default. But you can move it into a private folder named “My Charts” only you can access (you’ll find this folder below your team folder).That means that you can drag any charts (e.g. your drafts) to your private folder, work on them, and move them back to the team folder once you’re happy with it. How can I find charts I created? In the top-right, you'll find a powerful search. No matter in which chart you currently are, it searches across all charts you have access to: Your team charts and your personal charts. Chart type: pie chart, area chart, line chart etc.